Not strictly a herb, but in my apothecary, I make good use of whatever is to hand, and currently the garlic from the allotment is drying out nicely in my mother’s pantry. Strongly associated with Hekate, garlic has held magical associations for thousands of years. From warding off the supernatural, to disinfecting rooms, the protective power of garlic has been recognised and revered throughout history. Most of us know garlic for its smell and taste. It is the bulb of the plant that we most commonly use, although the green shoots that we see above the surface of the soil are also very tasty. Most often, the bulb is dried so that the papery outer skin can be peeled, revealing the glossy, white, oily flesh beneath. Garlic can also be eaten ‘wet’ or ‘green’, which means before it has been allowed to dry out. The flavour is milder, and the skin is somewhat waxy and I think it’s easier to peel off. Garlic is a star flavour in cuisines from India to the Mediterranean and beyond. It is unique in that it compliments spice, sweetness and saltiness in equal measure. Garlic is pretty easy to grow, and one clove (a segment of the bulb) should develop into a large bulb with many cloves. An added benefit to growing garlic is that it does discourage other pests from ransacking your garden! 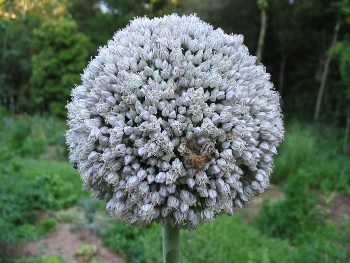 If you let the plant flower, you won’t be disappointed, as like most alliums, the flowers are beautiful; perfect, spiky globes. Our old friend, the Rosa Anglica, cites garlic as both useful and harmful for different ailments, although it is noted that garlic is mainly irritant in those that are not used to its strong flavour. In this herbal, garlic is mixed with salt to help reduce warts, and it is also indicated for those suffering with smallpox or related ‘pustules’. The same tome advises us to avoid garlic if experiencing lethargy, along with leeks and onions and any other substance that ‘increases phlegm’ in the body. Some of this advice makes sense, as garlic has strong anti viral properties and is especially indicated for those suffering with chest complaints, to help boost the immune system and fight off infection. The US National Library of Medicine tells us that further research in garlic is needed, but so far studies have discovered that the bulb reduces blood pressure in those with high blood pressure, but not in those with normal blood pressure. 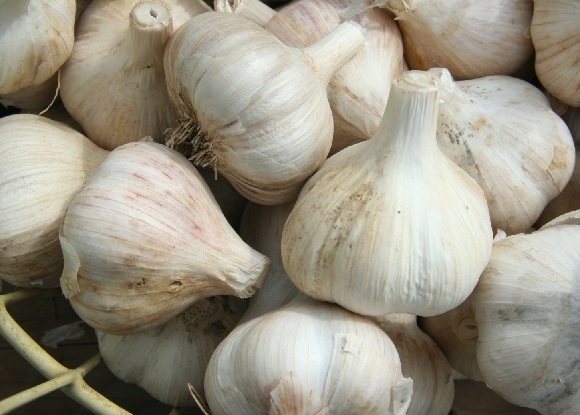 Garlic was also indicated as a possible preventer for colds, and even as a cholesterol reducer. In Korea, studies as recent as 2014 linked the high consumption of garlic to a reduced risk of prostate cancer. It’s sad that not enough conclusive tests have been done to prove these theories beyond a doubt, but it’s clear that the plant has very real health benefits, and is a very good addition to anyone’s diet. As well as culinary and medical uses, garlic juice is also used in glass and porcelain work for sealing and gluing. There is also now an insecticide which can be used for both crops and poultry which is derived from garlic. The benefit of this is it has no negative impact on the environment. Garlic continues to retain its antimicrobial (bacteria fighting) properties at very high temperatures, and as such is ideal for helping to preserve food. It’s clear that this is why meat cooked in hot countries, such as India, often has large amounts of garlic in, as it stops the meat spoiling. Garlic is particularly potent when combined with cinnamon, which as well as being scientifically sound, sounds particularly yummy! It’s time to look at garlic as a magical plant, although everything I have told you so far is sorcery in itself! What a practical bulb, with such diverse usefulness. Yet we have barely scratched the surface of the spiritual significance of garlic. In popular culture, one of the most well known uses of garlic is to ward off vampires. Now I don’t expect you will be having any undead blood suckers on your doorstep anytime soon, but it is true that garlic is protective and cleansing, warding off negative energies. Garlic cut and placed in a room will literally absorb any bad vibes and also literally absorbs bacteria, giving your space a full on cleansing. Onion is also useful for this, and either plant can be combined with lemon to boost the potency of the exercise. Garlic is also thought, in some eastern cultures, to stimulate desire and passion, so you could work this into your magical work. Perhaps eat a meal including garlic to increase the libido before a hot night! Remember to work your intent into the food as you cook it. Buddhism tells us that garlic distracts from meditation, which makes sense as it is a stimulant, both externally and internally. Islam also follows this, although from the more practical view point that the smell distracts from prayer. As mentioned earlier, garlic is one of Hekate’s foods and should be offered to her during Deipnon, her feast at the dark moon. Offerings can be left on her altar, or at a crossroads, as she is the lady of the triple crossroads and will always find these offerings. Garlic should be served with other foods such as fish, eggs, almonds, honey or cakes including these. Traditionally, the food should be placed and one should walk away, never looking back to see who was eating. The Greek playwright Aristophanes noted that the offerings to Hekate were often eaten by the poor and homeless; something I personally believe Hekate would have found very just. The juice of garlic can be used to cleanse your magical items, such as an athame, to dispel negative energy and boost your own intent. Wipe the blade in the juice then follow your own consecration or cleansing routines. I would normally leave the item in the light of the full moon, then cleanse it again with incense, a candle flame, water and salt or earth. Garlic is also protective against those trying to harm you, particularly those who are trying to de-energise you or weaken you somehow. In this way, it is excellent protection against vampires- the psychic kind, anyway. In the corner of each room, at the new moon, place a pot with a cut clove of garlic or a cut onion and a cut lemon. Think about how you wish your space to be your own, and imagine dirt and discomfort being sucked away. Clean the rooms and leave the pot until the full moon. At the full moon, the time of things coming to fruition, remove the pots and dispose of the garlic and lemon either by burying or burning (safely!). Do not use these fruit and veg as offerings in anyway. They are now full of germs and harmful energies and need to be removed from your home. Open the windows and let cleansing air into your rooms. Your home should feel lighter, more pleasant and safe. Alternatively, you can run this spell from new moon to dark moon, which is more effective if you have a specific dark energy to expel, as the dark moon is a powerful time for exorcism and banishment. Apparently garlic can be used to kill tree stumps. Instead of opting for harsh chemicals, drill some holes in the stump and insert garlic cloves, then cover with wood filler and soil. The garlic releases chemicals into the stump that prevent the regrowth of the tree. Bizarre, but apparently effective!